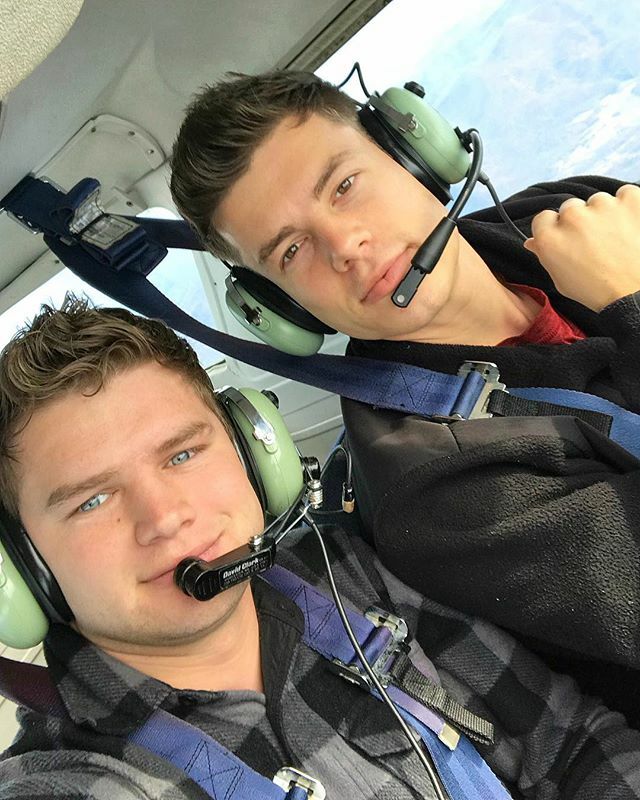 Today, Lawson Bates and Nathan Bates took a trip down to Florida, but rather than catch a commercial airliner or hop in a car, they flew themselves. Nathan, a licensed pilot, has been showing Lawson the ropes of flying a plane. The brothers landed near Orlando and paid a visit to Alyssa and John Webster, who are expecting daughter No. 3 in April. I thought Alyssa and John said they were not going to have another child so soon? Not every pregnancy is planned. They will handle baby 3 with overwhelming love. Love this family, so pure and honest. Nathan is such an amazing guy, so down to earth, loyal and compassionate. Hope both he and Lawson live their dreams to the fullest. Before I make this comment I want to say congrats to the Webster's John & Alyssa for soon to be parents for their 3 Rd daughter to be born in April. It's good for Lawson & Nathan to follow their dreams Lawson is following his dreams to be a country singer & Nathan a licensed pilot. So cool they payed a visit to see their nieces their sister & Brother in law In florida. I got question Lily & Ellie I know Josie Carlin are in a courtship. Will there be any news for the guys to be in a courtship soon like Trace Nathan & Lawson? One of the 3 guys? I would love to see that for next season of bringing up Bates. Neddy, I don’t believe the Bates Family arranges courtships and fast marriages for viewers ( and ratings). Two VERY good looking men - two very differnt looking men . . .Nathan resembles Gil/Lawson resembles Kelly. So good for them to be able to fly & visit Alyssa & John. I love that they went there and visited ther sister ❤️ Great family value! LOS SALUDO DESDE ARGENTINA: HACE ALGUNOS AÑOS PUDIMOS VER AQUI EN MI PAIS, EL PROGRAMA DE LOS DUGGAR, Y DE ESOS VIEJOS VIDEOS, CONOCI A LOS BATES, COMO ME GUSTABAN ESOS PRIMEROS VIDEOS DE ELLOS, CUANDO VIVAN EN LA VIEJA CASA, QUE ERA HUMILDE, PERO ACOGEDORA, UN HOGAR CRISTIANO, DONDE SE ALABABA AL SEÑOR Y COMPARTIAN EL ESTUDIO BIBLICO, DESPUES AGRANDARON SU CASA, GRACIAS A SUS AMIGOS, DESPUES ELLOS TUVIERON SU PROPIO PROGRAMA Y TODO CAMBIO. LOS BATES YA NO SON LA FAMILIA CRISTIANA QUE ME GUSTABA VER, HAN CAMBIADO Y MUCHO, HAN PERDIDO ESA ESENCIA, AHORA SALEN EN LA TELEVISION,SE RODEAN DE GENTE DE ALTO NIVEL, AHORA TIENEN DINERO Y SE DAN ALGUNOS GUSTOS QUE EN OTROS TIEMPOS NO LO HACIAN, SUS AMISTADES TAMBIEN SON DE DINERO, ELLOS YA NO SON LOS DE ANTES, AUNQUE PASE EL TIEMPO Y LOS HIJOS CREZCAN Y SE VAYAN, YA NO SON LOS BATES DE ANTES, ES COMO QUE EL EXITO SE LE SUBIO A LA CABEZA, HAN PERDIDO LA HUMILDAD. QUE PENA, HACE TIEMPO QUE NO LOS VEO, YA NO ME INTERESA MIRAR SUS VIDEOS Y TAMPOCO DE SUS AMIGOS LOS DUGGAR. ESPERO QUE PUEDAN CONTESTAR. Ana your comment is very judgemental. The Bates are very loving and godly people. They love the Lord with all their heart. And please kindly troll in English so others can understand you. Bates children all seem to have wonderful senses of humor - one happy family for sure - love/laugh together. Great parenting.